Thor by Kieron Gillen: The Complete Collection Review: A Tale of Action, Disaster, and Deceit – AiPT! 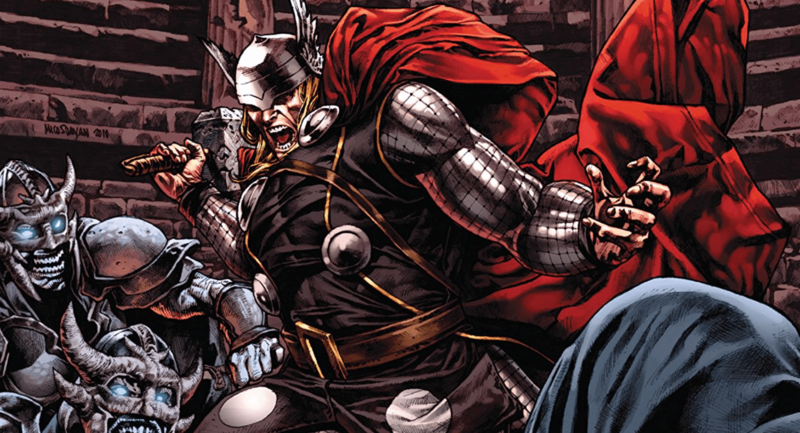 It’s Thor versus Dr. Doom, Loki, and Mephisto. Oh My! The story of Thor has lasted lifetimes, and the character has experienced more than anyone could have ever imagined. J. Michael Straczynski’s run begins with the premise of rebirth. It’s the idea that someone immortal who has had lifetimes of experiences in multiple realms and universes could be born anew on Midgard and have to lead his people and break the cycle one final time. Unfortunately, Loki gets in the way of Thor’s happiness with the help of Victor Von Doom. This is where Gillen’s run picks up, and it proposes a curious question that has always existed in comics. Is it right and fair to compare a writer’s run to the writer before, especially when the story continues between the two? Both writers created arcs that are entirely their own, but their runs are bridged and connected by a story that one started and the other finished. Its an uneasy line to walk as a reader, but for better or worse, the two runs cannot be separated, much like Thor and Donald Blake. Gillen makes no rush to conclude Straczynski’s work as the Dr. Doom conflict is resolved in six issues. The classic and noble manner of thinking and speaking still ring true with the lettering style and facial expressions giving the Asgardians a holy, godlike feel. The arc opens with tension and conflict as Kelda travels to Latveria to confront Loki. Gillen shows off some of his greatest talents throughout this collection remarkably well. He can write tension and conflict like no other. There is a deceitful, venomous aura to all of the characters in the run that makes the air thicker whenever they are speaking. It leads to shocking moments of action that leave the reader in awe. Billy Tan’s art in these first and second arcs provide enormous support along with the plethora of talented inkers, colorists, and letterers at Gillen’s disposal. The initial conflict is brutal, gruesome, and features yet another heartbreaking loss before an all out fight breaks out. The multiple panels of Dr. Doom holding Kelda by the neck are absolutely devastating. Gillen’s choices of angles and paneling convey emotion through action in ways that few writers can. Beyond Billy Tan, there are a number of standout artists that make an appearance during this run, namely Richard Elson and Doug Braithwaite. Elson’s work brings inspiring consistency to the exiled ruler of Asgard. Sharp line-work and crisp expressions allow the lightning to crackle with flair and for characters to explode with emotion and style through every issue he worked on. He can portray the grimaces and gazes of those with long destinies ahead of them as well as the fierce cutting and kinetic movement of battle. Braithwaite is extremely contrasting but no less talented. His work features a much softer touch portraying emotion through simple choices of perspective, facial expressions and the directions they’re looking. His art is reminiscent of great artists like Alex Ross and Jim Kreuger in the way that he brings feeling forth from the panels by having the character’s eyes stare directly at the reader or intentionally down and away. Along with these talented artists is an equally talented cast of colorists. Paul Mounts, Emily Warren, Matt Hollingsworth, June Chung, Nathan Fairbairn, and the list continues. Gillen’s writing may add the consistency as the color work varies from issue to issue, but the collection only grows because so many different colorists are able to contribute with their own styles and choices. The lettering also helps add to the consistency of the collection. Despite the fact that the duties are split between Joe Sabino and Joe Caramagna, both from the VC studio, so the consistency is no surprise. The consistent gothic flair to the Norse text, the bold red balloons of Mephisto, and the loud, confrontational KRAAAKs and KROOOOMs all contribute towards bringing the collection to life. Unfortunately, it often feels like there is only tension and conflict throughout Gillen’s run. Straczynski’s took the time to revel in the quieter moments of the country side and in the quiet moments of humanity. Gillen’s run pays almost no attention to humanity at all. The people of Broxton, Oklahoma are seldom addressed and Donald Blake makes only a few appearances. The reader barely gets a chance to breathe before the next conflict starts and no one is ever happy. Happiness is such a rare emotion to find throughout this collection and it weighs on you while reading it. There are heavy books out there, but the writer still needs to strike a balance so that the reader remains engaged and interested. There is not even a B plot to provides such hope most of the time, and the reader is left grasping at straws. Characters of myth are brought down to the depressing truths of reality and, sometimes, even further. For many readers, that’s not the reason they read Thor. The display of artistic talent in this collection is a delight. If only there were more large spreads to show off the gorgeous line work, breathtaking colors, and phenomenal lettering. The VC lettering studio represents themselves very well in this collection be consistently providing unique styles for every character. The phenomenal colors are beautiful, bold, and done by some of the best in the business. Each art style has something important to add to the overall story. The reader rarely gets a break from all of the tension and conflict going on around them, sometimes without purpose. Mephisto's presence becomes especially weak towards the end of the run. There is rarely a moment of calm or happiness for the reader to appreciate. Only gloom, deceit, and destruction await for most of the collection.